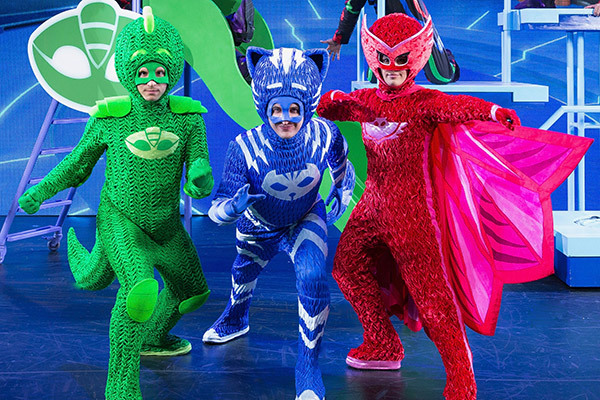 DES MOINES, IA ― Des Moines Performing Arts is pleased to announce that the hit musical production, PJ MASKS LIVE! Time to Be a Hero, will take the Civic Center stage for one performance only on Tuesday, May 8, 2018 at 6:00 p.m. The show is based on the popular Disney Junior television series, The PJ Masks! Tickets will go on sale Friday, March 2 at 9 a.m. and are available at DMPA.org, the Civic Center Ticket Office, or by phone at 515-246-2300. For additional information about PJ MASKS LIVE! Time to Be a Hero, please visit DMPA.org. Des Moines Performing Arts is a private not-for-profit organization celebrating 38 years of presenting the performing arts to Iowa and the surrounding states on four stages in Des Moines – the Civic Center, the Stoner Theater, the Temple Theater and the newly renovated outdoor space, Cowles Commons. Des Moines Performing Arts is a presenter of major Broadway and educational touring companies, performers and groups, and is home to many local and regional groups, including the Des Moines Symphony. All performances of the Broadway Series are supported by Willis Auto Campus. All performances at the Temple Theater are supported by Prairie Meadows. All performances of the Family Series are supported by Wellmark Blue Cross and Blue Shield. For more information, visit DMPA.org.